Inspired by a disjunction between the visual and the bodily/tectonic perceptions of food in molecular gastronomy, this thesis seeks to break the preconceived notions of how material is typically used in the field of architecture. By analyzing inherent conditions, behaviors, and responses of the chosen material, wood veneer, the palette of conventionally available, generic architectural material goes beyond its limitations; it expands and generates a new recipe of application while maintaining the original ingredient. The thin and flat surface radically changes its state and transforms into a rigid but soft fabric-like structure while aggregated as a column, which is one of basic components of building structures, offering beyond a mundane, normative experience from our preconception. 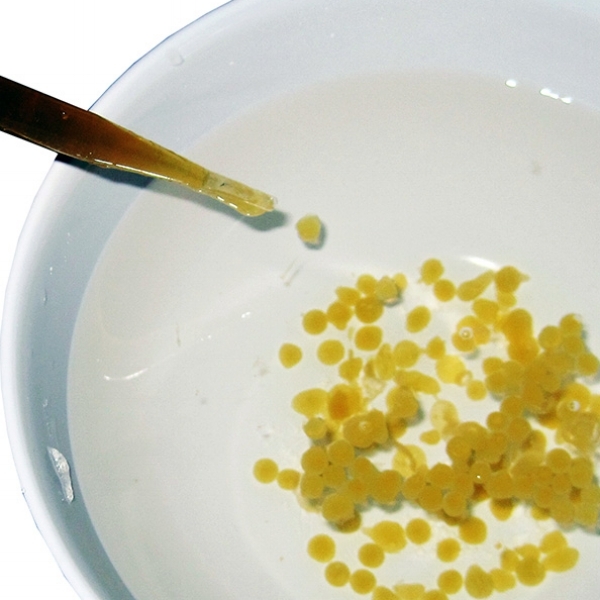 Spherification created apple juice caviar from liquid form. Gelification made pomegranate juice into spaghetti. Reverse spherification created spherified yogurt. Experimentation with molecular gastronomy kit. Molecular gastronomy is a subdiscipline of food science that seeks to investigate the physical and chemical transformations of ingredients that occur in cooking. Experimentation on combination of different materials to see whether there are changes in their inner structure or properties. Pattern and behavior study through wood veneer. The material is twisted, unwinded, relaxed and reformed. Wood veneer was soaked into water first for hours in order to make it flexible enough to fold into a desired shape. After folding and wrinkling it, it was dried to hold the shape. The contours and the failure points were marked and unfolded as soaked into water again. The marks became a plan for re-making the shape again after unfolded. The top image (3) is the plan drawn in Auto CAD after experimentation. The plans develop into different stages from the study of failure points. Not 100% but 80% is possible to predict in advance and able to create plans for a desired shape. Perforations were added where failure points are expected. Different sizes and locations were tested. 1 Unfolded pattern/plan of final model which shows combination of surface with solid and scored pattern. 3 Layers of this layout are laminated for structural integrity. Process: (scoring, folding, ironing/laminating/building) Step #1: fold along the lines from the pattern (all directions), Step #2: build up while following the order from pre-drawn plan (left). Shape is decided by how the each veneer acts from the scored patterns (different amount) and perforations, Step #3: by ironing, laminate 2-3 layers of veneer sheets while building up vertically also.